The number of groups visiting UBC's Okanagan campus this summer for conferences, workshops and other events will increase from 43 last year to over 60 -- with even more bookings expected as summer arrives. 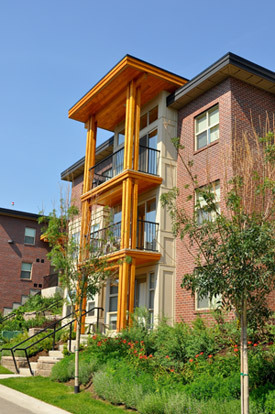 Accommodations this summer at UBC's Okanagan campus include the Cascades four-bedroom apartments (shown), townhouse-style City Homes, Monashee Studio Suites and one-bedroom apartments. Last summer, the campus had capacity to accommodate 650 people, and with construction of more student residence buildings, this summer the campus will be able to host groups of up to 900 people, says Suzanne Nazareno, Manager of Conference Operations at the university. "Our number of youth groups has increased, and educational workshops of all kinds -- from student-based conferences to health and wellness workshops, sport associations, and religious-based conferences -- are meeting on campus," says Nazareno. As well, family reunions are increasingly popular during the university's summer accommodations season, from mid-May to August 12. "'Everyone Can Stay' is a message we'd like to get out," Nazareno says. "We are also open to individual travelers and can provide a variety of accommodations to suit people's needs. Budgets for everyone and it's easy - you can book online." On-campus accommodations include townhouse-style City Homes, Cascades four-bedroom apartments, Monashee Studio Suites and one-bedroom apartments. More budget-conscious alternatives are the Okanagan single rooms with shared kitchen and common area space. Revenue from conferences and accommodations operations helps to pay for the campus student residences. With the addition of new Upper Cascades and Nicola student residences last fall, UBC surpassed its original goal of having 1,000 student beds on the Okanagan campus. Nazareno says the university is reintroducing the Taste of University education program, starting this month and continuing into June. Through this partnership between the university's offices of Conferences and Accommodations, Student Recruitment, Residence Life and Career Services, Okanagan-region school groups from Grades 6 to 11 visit the campus in Kelowna to sample the UBC experience. Students get an orientation tour of the university, an educational workshop, tours of the student residences, and discussions with residence life leaders about learning and leadership opportunities on campus. Students spend a night on campus, enjoy some fun evening activities, and have a chance to reflect on their experience prior to departure. This year, the program will see approximately 400 students visit campus and experience campus life. More information is online at http://okanagan.ubcconferences.com/.